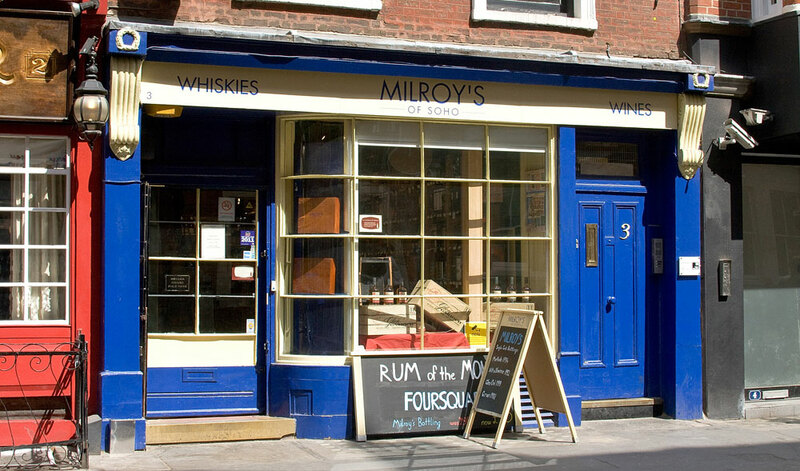 Milroy's of Soho Finest Blended Malt (40.0%): Milroy's of Soho is one of the oldest wine merchants of London. The shop is located in north of Soho on Greek Street. They carry a wide range of whiskies from all over the world and also bottle their own whiskies and rums. This is their blended malt expression. There is no info on the label about which distilleries the whisky is coming from. It only says "distinguished Highland and Speyside distilleries". It is aged in refill hogsheads. Color: Dark amber, clover honey. Nose: Hot toddy... Green grass, damp garden turf and new make spirit. Freshly squeezed lemon, raw honey, caramelized dates and prunes. Very sweet, thick and syrupy. Palate: Much thinner mouthfeel than the nose suggested. New make notes hit immediately but not in a disturbing way. Quite energetic and vibrant. Dried dark fruits, lemon zest, honey and sweet malt. White pepper, toasted oak and roasted unskinned hazelnuts. Finish: Not very long but pretty spicy. Tongue tingling; liquorice, black pepper and pumpkin pie spice. Overall: Great everyday whisky with a very reasonable price tag of £19.95. I would prefer this bottle to any entry level blended scotch whisky in the market at the same price category. Totally surpassed my expectations. It's very enjoyable neat or with a single ice cube in front of TV after dinner or on your porch at a weekend afternoon.